Ben Amor, M. M., Ben Souissi, J., Ben Salem, M. & Capap�, C. Confirmed occurrence of the longjaw snake eel, Ophisurus serpens (Osteichthyes: Ophichthidae) in Tunisian waters (Central Mediterranean). Pan-American Journal of Aquatic Sciences, 4(3): 251-254. Download PDF file (203 Kb). Mej�a-Falla, P. & Navia, A. F. New records of Urobatis tumbesensis (Chirichigno & McEachran, 1979) in the Tropical Eastern Pacific. Pan-American Journal of Aquatic Sciences, 4(3): 255-258. Download PDF file (121 Kb). Albuquerque, C. Q., Muelbert, J. H. & Sampaio, L. A. N. Early developmental aspects and validation of daily growth increments in otoliths of Micropogonias furnieri (Pisces, Sciaenidae) larvae reared in laboratory. Pan-American Journal of Aquatic Sciences, 4(3): 259-266. Download PDF file (356 Kb). Xavier, J. A. A. & Volcan, M. V. Registro da preda��o de girinos de r� touro (Lithobates catesbeianus) pelo bigu� (Phalacrocorax brasilianus) no estu�rio da Laguna dos Patos, Rio Grande do Sul, Brasil. Pan-American Journal of Aquatic Sciences, 4(3): 267-270. Download PDF file (311 Kb). Benitez, R. S. & S�arez, Y. R. Biologia populacional de Serrapinnus notomelas (Eingenmann, 1915) (Characiformes, Cheirodontinae) em um riacho de primeira ordem na bacia do rio Dourados, Alto rio Paran�. Pan-American Journal of Aquatic Sciences, 4(3): 271-278. Download PDF file (739 Kb). Martinez, G., Scarabino, F. & Delgado, E. A. New records of the brachyuran crabs Hepatus pudibundus (Aethridae) and Persephona mediterranea (Leucosiidae) in their southernmost Western Atlantic distribution. 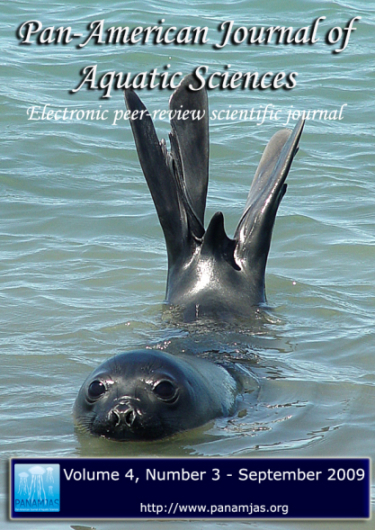 Pan-American Journal of Aquatic Sciences, 4(3): 279-282. Download PDF file (151 Kb). Teles, L. J. S. & Saito, C. H. Ballast water and sustainability: identification of areas for unballasting by geoprocessing � case study in Todos os Santos Bay, Brazil. Pan-American Journal of Aquatic Sciences, 4(3): 283-293. Download PDF file (414 Kb). Ghidini, A. R., Serafim-J�nior, M. & Perbiche-Neves, G. Distribution of planktonic cladocerans (Crustacea: Branchiopoda) of a shallow eutrophic reservoir (Paran� State, Brazil). Pan-American Journal of Aquatic Sciences, 4(3): 294-305. Download PDF file (457 Kb). Santos, M. D., Albuquerque, M. C., Monteiro, C. M., Martins, A. N., Ederli, N. B. & Brasil-Sato, M. C. First report of larval Spiroxys sp. (Nematoda, Gnathostomatidae) in three species of carnivorous fish from Tr�s Marias Reservoir, S�o Francisco River, Brazil. Pan-American Journal of Aquatic Sciences, 4(3): 306-311. Download PDF file (101 Kb). Nagata, R. M., Haddad, M. A. & Nogueira Jr., M. The nuisance of medusae (Cnidaria, Medusozoa) to shrimp trawls in central part of southern Brazilian Bight, from the perspective of artisanal fishermen. Pan-American Journal of Aquatic Sciences, 4(3): 312-325. Download PDF file (787 Kb). Santana, G. X., Fonteles Filho, A. A., Bezerra, L. E. A. & Matthews-Casc�n, H. Comportamento Predat�rio Ex situ do Caranguejo Menippe nodifrons Stimpson, 1859 (Decapoda, Brachyura) sobre Moluscos Gastr�podes. Pan-American Journal of Aquatic Sciences, 4(3): 326-338. Download PDF file (615 Kb). S�nchez-Alf�rez, A. S., �lvarez-Le�n, R., L�pez, S. G. B. C. & Pinz�n-Flori�n, O. P. Aspectos fitosanitarios de los manglares del Urab� Antioque�o, Caribe colombiano. Pan-American Journal of Aquatic Sciences, 4(3): 339-346. Download PDF file (147 Kb). Haluch, C. F., Freitas, M. O., Corr�a, M. F. M. & Abilhoa, V. Varia��o sazonal e mudan�as ontog�nicas na dieta de Menticirrhus americanus (Linnaeus, 1758) (Teleostei, Sciaenidae) na ba�a de Ubatuba-Enseada, Santa Catarina, Brasil. Pan-American Journal of Aquatic Sciences, 4(3): 347-356. Download PDF file (774 Kb). Roque, F. O., Siqueira, T. & Escarpinati, S. C. Do fallen fruit-dwelling chironomids in streams respond to riparian degradation?. Pan-American Journal of Aquatic Sciences, 4(3): 357-362. Download PDF file (65 Kb). Pimentel, M. F., Lima, D. P., Martins, L. R., Beatriz, A., Santaella, S. T. & Lotufo, L. V. C. Ecotoxicological analysis of cashew nut industry effluents, specifically two of its major phenolic components, cardol and cardanol. Pan-American Journal of Aquatic Sciences, 4(3): 363-368. Download PDF file (275 Kb). De Santana, W. M., Silva-Leite, R. R., Da Silva, K. P. & Machado, R. A. Primeiro registro de nidifica��o de tartarugas marinhas das esp�cies Eretmochelys imbricata (Linnaeus, 1766) e Lepidochelys olivacea (Eschscholtz, 1829), na regi�o da �rea de Prote��o Ambiental Delta do Parna�ba, Piau�, Brasil. Pan-American Journal of Aquatic Sciences, 4(3): 369-371. Download PDF file (522 Kb). Costa, M. D. P. & Souza-Concei��o, J. M. Composi��o e abund�ncia de ovos e larvas de peixes na ba�a da Babitonga, Santa Catarina, Brasil. Pan-American Journal of Aquatic Sciences, 4(3): 372-382. Download PDF file (204 Kb). Ferreira, C. dos S., Vaz, B. dos S., Velasco, G., Tavares, R. A., Hellebrandt, D. & Albergone, E. H. Poseidon Linux 3.x - The Scientific GNU/Linux option. Pan-American Journal of Aquatic Sciences, 4(3): I-VI. Download PDF file (207 Kb).